If you lose games by hanging pieces, our new game ‘route planner’ is something for you! With this game you learn to have a better control of the potential of the pieces and you will improve your board visualization skill. It's all about the way you visualize the movements of the pieces in your mind’s eye. Your goal is to give check with the white piece on the board. Only the shortest solution counts. Only white (you) will move a piece. You are not allowed to place your piece on a square where it can be captured. 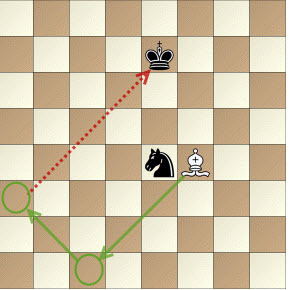 You are allowed to capture undefended black pieces. First spot the square to check the king! A3 is the square in this position. Then find the route to the checking (a3) square! "Your visualization skill will improve because during the game the black pieces are hidden!"